Call (603) 672-0032 for availability. McOsker Kennels is a family business that loves animals. We offer boarding, professional grooming, day care, and private obedience training services for your dogs and cats. Plus we are a breeder of American Kennel Club (AKC) Labrador Retrievers. Here at McOsker Kennels we strive to provide the best service for your pet possible. Our boarding facilities are attached to our home and are monitored 24 hours a day. Your pet is charged a full day when he/she arrives regardless of time. Check-out time is 12:00 pm. Pets picked up after this time will result in a full day charge. We request a 48-hour notification of cancellation or early pickup. Failure to notify us will result in your being billed for the entire scheduled stay. If you are boarding your pet, we suggest you schedule a grooming appointment for the day of pick up. If your pet is groomed the day of pick-up, you will not be charged for boarding that day! Your cat's home away from home. McOsker Kennels can provide private obedience training for your pet. Our training includes both on and off leash work, teaches basic commands, socialization, manners, and is designed to prevent behavior problems using positive reinforcement. We also provide advice on house breaking, chewing problems, and interacting with children or strangers. These lessons are reinforced while your pet boards with us. If you require additional training for your pet, we are happy to provide you with alternative resources. Labrador Retrievers are gentle with children, have a very stable temperament, and are non-aggressive which makes them one of America’s favorite and most popular breeds. McOsker Kennels 3rd generation, top quality puppies are bred for looks, temperament, and natural ability. We import top lines from Sweden. 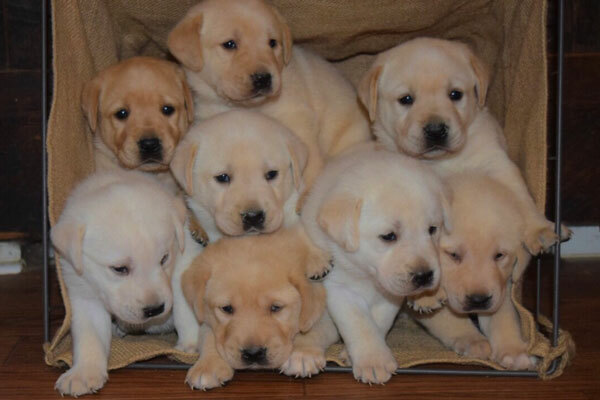 Our Labrador Retrievers are well conformed with a short flat coats, short tails, which meet the standards set in the American Kennel Club (AKC) guidelines and are bred for agility, obedience, appearance, color, temperament, athletic ability, and hunting (field dogs) as well as show quality characteristics. When mature they can stand between 22-1/2 to 24-1/2 inches tall and weigh between 65 to 80 lbs. Purchase includes papers, registration, DNA registration, joint X-Ray, and eye test. Labrador retrievers purchased from McOsker Kennels continue to receive a 10% discount on all our boarding, grooming, and day care services during their life time. ©2004-2018 McOsker Kennels. All Rights Reserved.